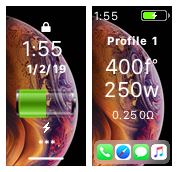 The two icons toward the middle if the screen are selectable, the left one takes you to Device Monitor and the right takes you to Puff Info. 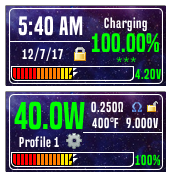 The value below the left icon displays the achieved wattage during the last puff, this is mostly useful for temp control but it can also be useful for battery diagnostic. 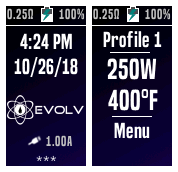 The value below the right icon display last puff time. 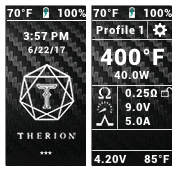 Selecting the coil material (when in temp control) will take you directly to Atomiser Settings. 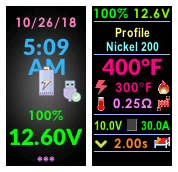 The values at the very bottom are board temperature and battery voltage, useful for quick diagnosis. 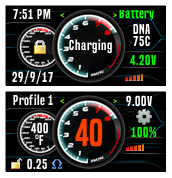 -Large battery bar on lock screen for quick viewing. 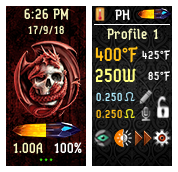 Evolv version of my Therion theme, for other DNA75C devices. 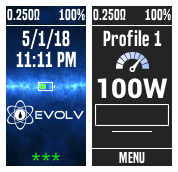 Several modifications keeping the overall default Evolv theme look. Main screen "Firing" now red when firing as well as all menu or status bars. 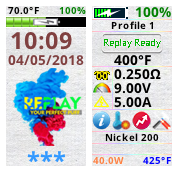 On main screen when not in active Replay saved puff you can select the ohm reading to shortcut you to the Coil Info screen. Most "Back" buttons removed and scroll up of down off the screen to go to the previous screen. 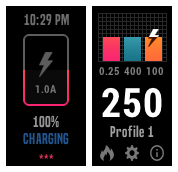 Watts now adjustable in 1 watt increments instead of .1. Temp adjustable in 5 degree increments. 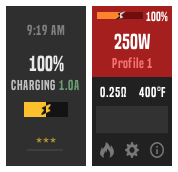 New menu platform dived into Profile, Puff Info, Coil Info and Settings on main menu. 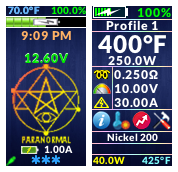 New coil install screen now has cold ohm temp for new coil and old coil resistance and temp when deciding on new coil or keeping old settings. 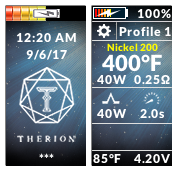 Profile Menu has added cold ohm temp with current ohm reading and coil material setting added. Also added is the availability to have advanced preheat settings with the Preheat+ toggle when temp control is active. 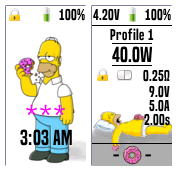 Puff Info screen enhanced with chart and ability to change wattage and or temp for dialing in a perfect puff. Also the addition of several live readings of the last puff. 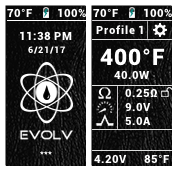 Live ohms, room temp,average power, puff duration, puff volts, puff amps, and average puff temp, and max puff temp when in temp control. 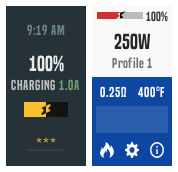 When a non-temp sensing coil is installed gives you current battery % instead of temp. Recording Screen with new additions to be able to monitor with every puff. 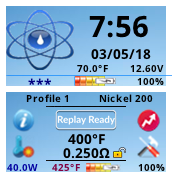 New Coil Info screen added with time, battery %, current profile, coil material, cold ohms, live ohms, coil temp, ability to remeasure resistance, and ability to lock ohms. New settings menu with System, Display, Device, and About. System gives you date, time, 12 / 24 hr, F or C temp, max puff time and serial number. 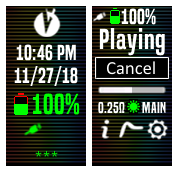 New Display menu has brightness adjustment, always on, stealth level, auto lock, auto lock time out, and # of clicks to lock, and ability to set unlock device sequence. 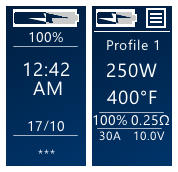 Device screen now has power bank settings, and battery voltages for up to 4 batteries. 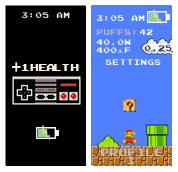 About Menu with Lifetime puff count, Theme revision, current firmware, current revision, edition, current puff count, puff count total energy, and reset to take you to a rest statistics screen. Thanks to everyone on the Evolv forum for ideas and themes to give me inspiration for this theme! Mario jumps when you hit the fire button. Let me know if you think of any improvements. I tried to do a thème with lot of informations on the main screen and also easy to " use " . - I add some little chaNges on the V2 . - The last version , in fact , there is no change , exept that I translate some parts in French . PS : Very sorry for my " poor " english language . 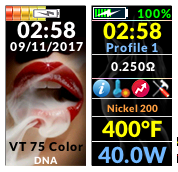 My first Theme for the DNA75C. Based on JoeCockBill´s Therion theme. 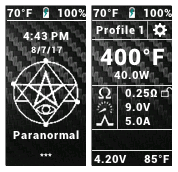 All credit goes to JoeCockBill and his Therion Carbon theme, I just adapted/tweaked the theme to be more Paranormal orientated. Designed to incorporate as much data and settings as possible while remaining clear and easy to navigate. Feedback and suggestions would be greatly appreciated!